The Maintenance Log shows a list of assets available for creating maintenance events in a new work order. Hide Inactive assets – Display only information about active asset items. 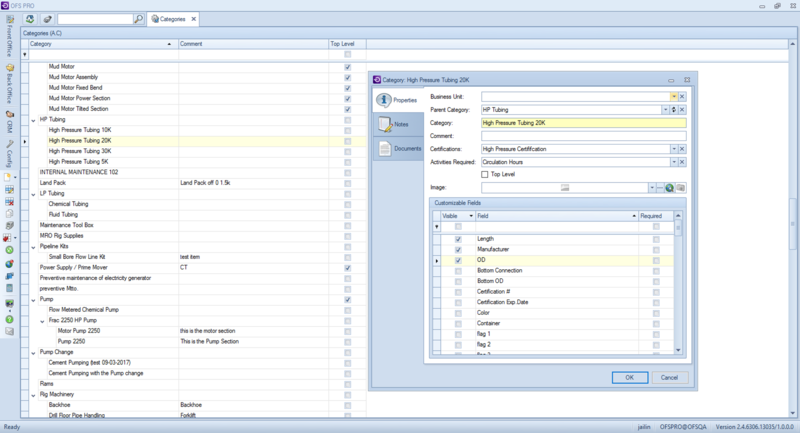 Top Level only – Show only Asset Categories marked “Top Level”. Show only Assets with Scheduled Maintenance – Hide all asset items except those scheduled for maintenance. Top Parent ID and Top Parent Name (if the asset is part of an asset kit and is not top level). Asset ID and Asset Name. Parent Category (if one exists). Percent Due (the ratio of asset use to a target value, based on when the asset should next undergo maintenance). Description of the maintenance that was made and is scheduled to be done. Estimated Date that the next predicted maintenance should occur. Last Value recorded (from the previously-defined Value Type) and Target Value (for when the asset should next be seen for maintenance). Last Service Date and Last Service Value (record of the last time the asset was maintained). Number of the Job the asset is currently on, if any. Business Unit and Area associated with the asset. 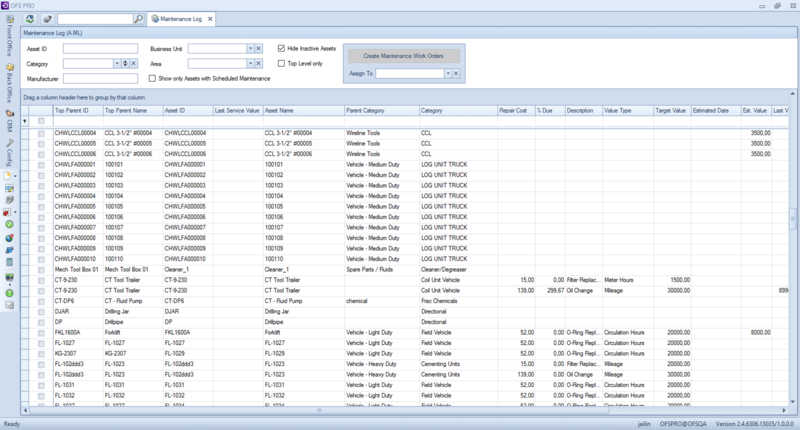 To create a new maintenance work order, you would need to create in advance: an asset category, an asset, and a recurring work order to link the new maintenance work order to any of these groups. Select a Business Unit from the drop down list. Take note of the Business Unit selected. Take note of the new category. The New category is added to the categories list. Select the same Business Unit selected for the previously created category. Select the previously created category. The New asset is added to the asset listing. Click on Front Office>Scheduling>Recurring Work Order. Select any Job type, then click the next button. Select any customer, then click the next button. Select any location, then click the next button. Select any Job Contact, then click the next button until the following appears on the screen: “Recurrence Type and Length”. Type the duration (hours) and select the previously created Asset Category. Select the Recurrence type: daily. Now select the Recurrence type: Weekly. Now select the Recurrence type: Monthly. Now select the Recurrence type: Yearly. Now select the Recurrence type: By Usage. Select any asset activity from the drop down list. Type a value in the Activity Value Field. The new recurring work order is added to the list. Find the previously created asset and select the checkbox on the left side. If the asset is not listed or the checkbox cannot be checked, the asset is not associated with a recurrent Work Order. In the upper right corner, click on the Assign to field and select an employee from the drop down menu. Click on Create Maintenance Work Orders. Click on Front Office> Scheduling>Work Orders. In the status field, select the Pending Status and click OK. Set the Field Type field to either Internal or Customer. Click on the Find option. In the Supervisor column, search for the name assigned to the maintenance event created earlier. Right-click on any part of the grid and select Edit. In the Assignments tab, add some employees to the Work Order. The new maintenance event has been created.